The combination of elegant design and oversight by Chris Haaland (McMillion Engineering), helicopter support by Classic Aviation, precision fabrication by Sam Riggs (Page Steel) and safe/productive installation by our Adventure Partners rigging crew (Dave Carmen, Jeremy Draper, Nate Jordan, Christian Seamans and Mike Friedman) has produced an extraordinary attraction for Amangiri guests. 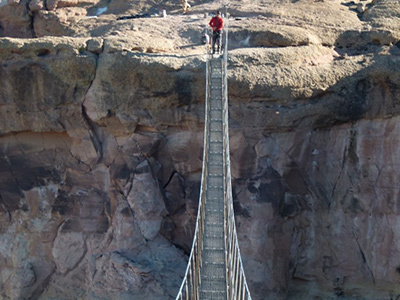 There is something magical about suspension bridges, with their great strength and minimalist structure. The integrity and grace of a cantenary curve invites us to span seemingly unattainable distances. 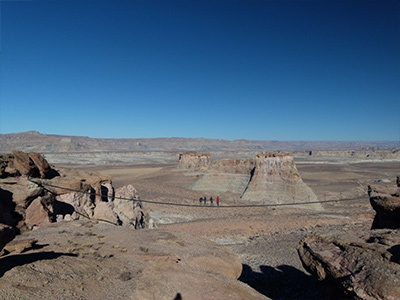 Adventure Partners extends a special thanks to Canyon Equity, Christoph Henkel and Amanresorts. 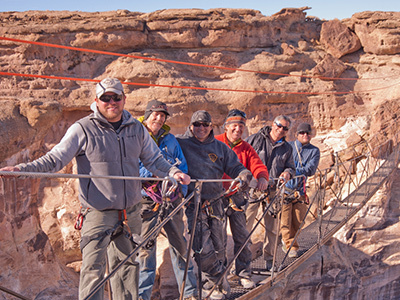 Without their vision, support and encouragement, the Amangiri Hoodoo Suspension Bridge would have remained forever on the drawing board.